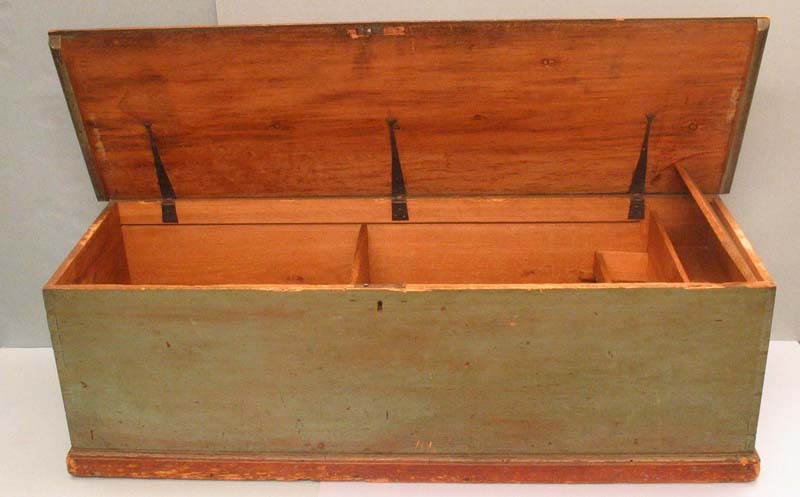 A sea chest that belonged to Constitution Boatswain’s Mate Andrew Knowland, before 1819. USS Constitution Museum collection. hammocks and their bags; stowing a few frocks and trowsers in the former; so that they can shift at night, if they wish, when the hammocks are piped down. But they gain very little by this. It seems that the unpainted duck linen bags that one frequently sees in museum collections were personal bags used for transporting clothing from ship to shore or shore to ship. When a seaman entered a vessel, the purser issued him a painted bag to use for the duration of the cruise, and he relegated his personal bag to the bottom. The Navy considered this bag government property, to be returned when a man left the ship. Boston sailmaker Thomas Kendall supplied Constitution with 500 hammocks and 250 bags in 1812 and Navy Agent Amos Binney paid for them just like any other piece of ship’s equipment. Purser Thomas Chew’s bag, 1812 to 1832. USS Constitution Museum collection, photo by David Bohl. museums today, admired as pieces of folk art. Gunner John Lord’s bag. He served on Constitution between 1824 and 1828, and died at Charlestown in 1829. USS Constitution Museum collection, photo by David Bohl. If you want to try your hand at making a sailor’s clothing bag, you’re in luck. This April, the Museum will host a workshop for participants to learn how to sew a full-size replica of the clothing bags that Constitution’s sailors took to sea. Led by the Museum’s research historian, participants will explore examples from the Museum’s collection, and then sew one using period materials and techniques. For more information, click here. USS Constitution Log, 2 Sep 1803. “Internal Rules and Regulations for the US Frigate Constitution 1803-1804, by Captain Edward Preble, US Navy, Commodore of US Mediterranean Squadron,” in Naval Documents Related to the United States Wars with the Barbary Powers, Vol. 3 (Washington, DC: Government Printing Office, 1941), 35. Herman Melville, White Jacket; or, the World in a Man-of-War (London: Richard Bentley, 1850), 54-55. The term “sea-bag” to refer to a sailor’s clothing bag does not seem to have been in general use before the 1850s. Even then, it is almost always used in a military context as a bag for soldiers to keep their belongings in while on board transports. Not until the 1880s does the word “seabag” appear in sailor’s narratives. Amos Binney voucher to Thomas Kendall, 29 Oct. 1812, in Fourth Auditor Settled Accounts, Alphabetical Series, RG 217, Box 39, NARA. The bags cost 25 cents each to make. The USS Constitution Museum in Boston has in its collection a bag that belonged to Purser Thomas J. Chew (resigned 1832) and two bags that belonged to Gunner John Lord (d. 1829).